Sometimes its difficult to keep up with all the photographic newsletters that hit my inbox and they usually get a cursory once over and then get filed away in my inbox. But once in a while something will resonate with me and I will go back and search for that article. One of the recent LensCulture newsletters introduced me to Beth Moon and I was quite blown away by her Portraits of Time: Ancient Trees. The featured series was about ancient trees – trees that had stood the test and ravages of time, some are documented to be about 4,000 years old and clearly will be around for some time to come yet if mankind doesn’t destroy the planet. Beth explains that this series is printed by using a platinum/palladium process which is hand-coated onto the print. Apparently this process will preserve the print for centuries. She uses this technique in a sense to pay homage to the survival of this ancient trees. Beth Moon has captured the majestic elegance of all the trees in her series in a very poetic way. One might well classify this series as landscape, but I think it would fit equally well into portraiture because each tree’s unique character, idiosyncrasies, foibles and beauty are on display. From the upside down baobabs to the luxurious Bowthorpe Oak, to the UFO-like Heart of the Dragon, to the split Linton Yew, to the succulent quiver trees (another reminder of my old home country – we used to have one of these in our garden) to the quirky Ifathy Teapot and the serene Zalmon Olive trees, there is an overall underlying atmosphere of respect and dignity in all the images. This entry was posted in Photograhers, Research and Reflection and tagged Beth Moon, LensCulture, Portraits of Time: Ancient trees on December 4, 2014 by lynda512863. I came across Elena Chernyshova’s work through a LensCulture newsletter of 16 April, 2014. There was a photograph of a tall, dilapidated apartment building which, without having read the caption, caught my attention. Having been to Cuba last year, the architecture (and neglected state of the buildings) resonated with me. The building is green and cream, and is in a state of disrepair; three cars are parked to one side, a man’s figure is standing in the background while a figure, probably a child judging from the size is pushing a baby buggy across the snow laden road. The building consumes the whole frame dwarfing the two individuals and one gets the impression that the building extends past the left, top and right boundaries of the frame – almost like a Burtynsky photo. 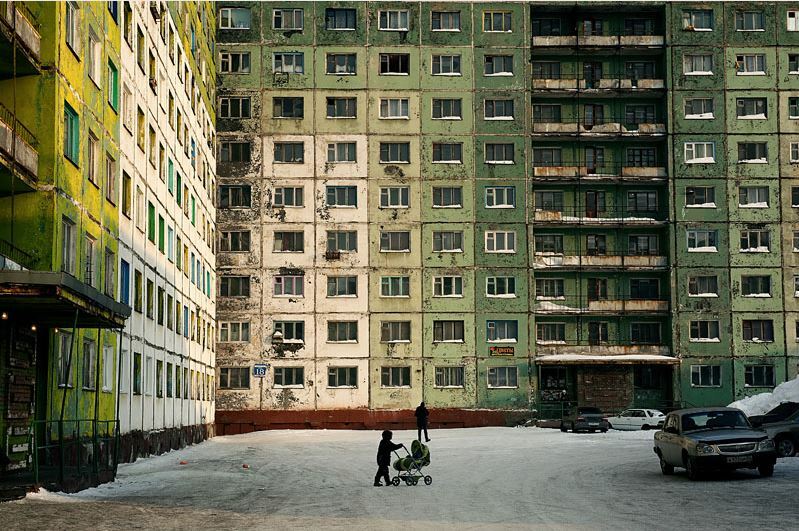 The majority of the buildings in Norilsk, Russia, are constructed with pre-built panels. These buildings were called “Gostinka” and were considered temporary accommodations for newly arrived workers, but many of them became permanent dwellings and remain today. © Elena Chernyshova. Reproduced with permission. Elena Chernyshova is a self taught Russian documentary photographer who is based in France. After working as an architect for a couple of years, she went on a bike trip from France to Russia and back again and due to the various cultural experiences she experienced on this trip, she decided to become a photographer. She investigates living styles of communities who are impacted by various political, economic and industrial conditions and how they cope under these circumstances. She has published in National Geographic, Newsweek Russia, Le Monde, Days Japan and Life magazine among others. Elena was awarded a grant from the Lagardère Foundation to create a documentary about the daily life of the industrial city of Norilsk, which is the world’s most northern city, located 400 kilometers north of the polar circle, in Siberia. She also won three other awards for this series. The city of Norilsk was an original Gulag labour camp and is also one of the filthiest cities in the world, spewing noxious gases of paladium, nickel and copper into the atmosphere and where nothing grows for miles. The inhabitants of the city have to deal with snow for about 270 days of the year. During the summer the sun doesn’t set for 6 weeks and during the winter the sun doesn’t rise for 6 weeks as well. Talk about throwing one’s body clock for a total loop! With average temperatures of -27C and lower in the winter and a balmy 14C in the summer, how do people adapt to these type of conditions? Elena’s collection, Days of Night/Nights of Day can be seen on the LensCulture website. There are forty five photos in the collection. Chernyshova has captured the stark, haunted beauty of this wasteland. If some of the photos are taken out of context, they would have an almost romantic feel to them, e.g. No. 3 of 45 – the ruined white walled mansion standing amidst snow covered knolls (actually snow covered rubble) with a beautiful pink haze in the background (no doubt this is the polluted sky). The street scene in No. 14 of 45 with the classic lines of old architecture also fall into this “romantic” category and so does No.19 of 45. But then the photographer brings us back to earth to show us the extreme pollution of the city: No. 2 of 45 (see image below) (a factory which one can barely make out – just a chimney or two are visible, spewing smoke into the atmosphere); No. 5 of 45 (a bus carrying workers to a nearby factory, winding its way through pylons as far as the eye can see); No 10 of 45 (the wasted tundra where acid rain falls). With a population of 175,000 inhabitants, Norilsk is among the biggest cities above the Arctic Circle. This city-factory has only one reason to exist: maintaining the biggest metallurgical and mines complex in the world. This complex by itself is worth approximately 2% of Russia’s GDP. © Elena Chernyshova. Reproduced with permission. Three plants of Norilsk — the nickel factory, the copper factory and the metallurgical complex “Nadejda” (“Hope”), were built successively in 1942, 1949 and 1981. 56% of the population works in these places. Here is the melting department. The workers wear masks at all times to filter out the gaseous fumes. © Elena Chernyshova. Reproduced with permission. And then she shows us the people: No. 4 of 45 (Anna Vasilievna Bigus, now 88, who spent ten years of her youth in the Gulag where her only joy was to sing, holds up a photo of herself in her youth. There is very little change in her expression from then and now – the sad, forlorn expression evident on both countenances); No. 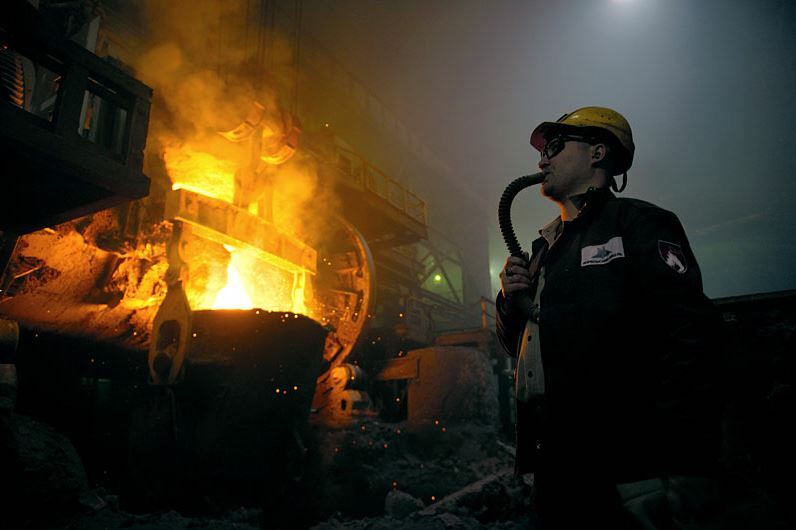 9 of 45 (see image left) (a worker stands in front of a smelter holding a long pipe to his mouth. The caption says workers must wear masks at all times to filter out the noxious gases, but this man does not have a mask over his nose, just a breathing pipe in his mouth); No 12 of 45 (a young lady stands centre frame with a surgical mask over her nose and mouth to combat the smog during summer); No. 23 of 45 (two youngsters sitting at a table celebrating something festive, possibly Christmas due to the bauble and candle decorated sprig of spruce on the table and the two other sprigs in bottles on the shelf. Coloured lights are strung up on the wall and the young boy is wearing a tinsel garland around his neck. But their expressions are sad and bored); No. 24 of 45 (a young man is spritzing his house plants which seem to cover every flat surface of the room – a stark contrast to the wasteland that is outside his walls). Due to the extreme cold temperatures, children often have to spend months indoors and special places have been created for them to run and play indoors, do sport: No. 28 of 45 (children riding their scooters indoors); No. 29 of 45 (girls doing gymnastics); No. 38 of 45 (young toddlers doing physical activities without their clothes in order to toughen them up to the harsh climatic conditions). During the summer months people lie tanning on grey rooftops and in the distance the factories continue to spew their gases (No. 40 of 45) and summer is celebrated with barbecues on the lakeside 30km from Norilsk: the beach is grey, the water is grey, the mountains are grey and the people are bundled up in coats (No. 44 of 45). Chernyshova’s photos document this terrible landscape and the tragic life of its inhabitants (many die at a young age of cancer) in a very skillful way. I find the collection intensely honest. At times she is removed, looking in from afar, at other times she is in the homes of the people, visiting the elderly, playing with the children. It definitely comes across that she spent a lot of time with the inhabitants, and indeed, upon further research I found that she spent eight months documenting this project. It is well worth a viewing. I only wish I could see the originals in a gallery because I think the impact would be greater. Photography for me is a continuing learning. Every time when I am working on a project, analyzing its results, talking with editors or other photographers, watching other documentaries I get valuable lessons. I just can’t select one specific lesson that determined my vision and style. The key point for me is to observe a lot and to take my time, never hurry, but to be very reactive and precise at the same time. Only one moment is important, one second earlier or later and this moment can be lost. I am learning to divine how the situation will be developed and where should I be to capture its essential “key” moment. The second important point for me is to become invisible for people. They should forget about my existence, don’t react on the camera and live their own life. 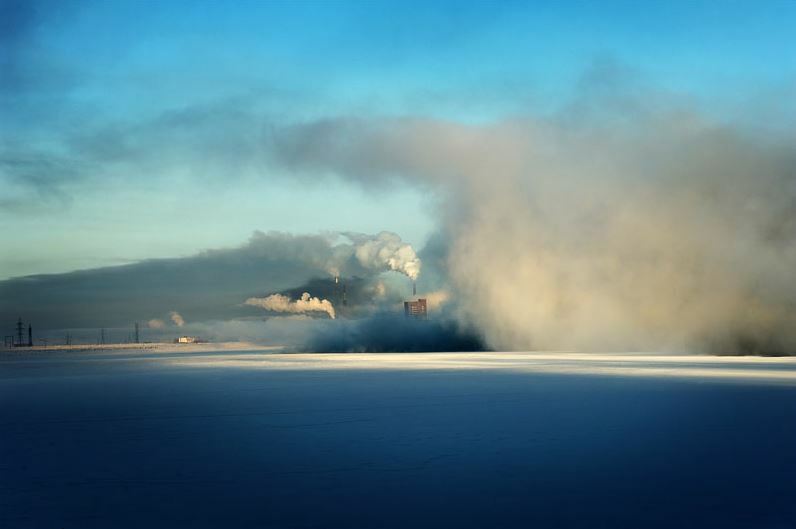 This entry was posted in Photograhers, Research and Reflection and tagged Days of Night/Nights of Day, Elena Chernyshova, LensCulture, Norilsk on August 8, 2014 by lynda512863.